Smokey Gruyere cheese and a sweet Sun-Dried Tomato Chutney dress up crunchy chicken in this new Chicken Tender Quesadilla. 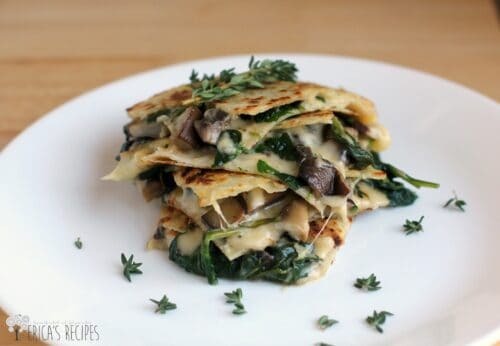 This simple recipe comes together lickity-split for a tasty lunch or quick weeknight dinner. Cooking spray (random, yes. but hang in there). One of the best inventions like everrr is cooking spray, don’t you think? Because we can use cooking spray to make all kinds of “grilled” stuff. Rarely does a day go by that I do not use olive oil cooking spray to make something like a grilled ham and cheese sandwich. Lately, I’ve been on a kick of making grilled cheese sandwiches in Pita bread with cheddar, deli chicken, and turkey bacon. And quesadillas. Constantly. Flour tortilla, corn tortilla, doesn’t matter, they both totally work. No oil or butter needed. Just a little spritz does the trick and keeps these yummies light. So, okay. Having established that I love using cooking spray to make crispy, yummy, grilled cheesy things, we get to this quesadilla. ..Which uses purchased chicken tenders. So, if you would like, just replace the fried chicken with some baked chicken tenders. Viola happiness! 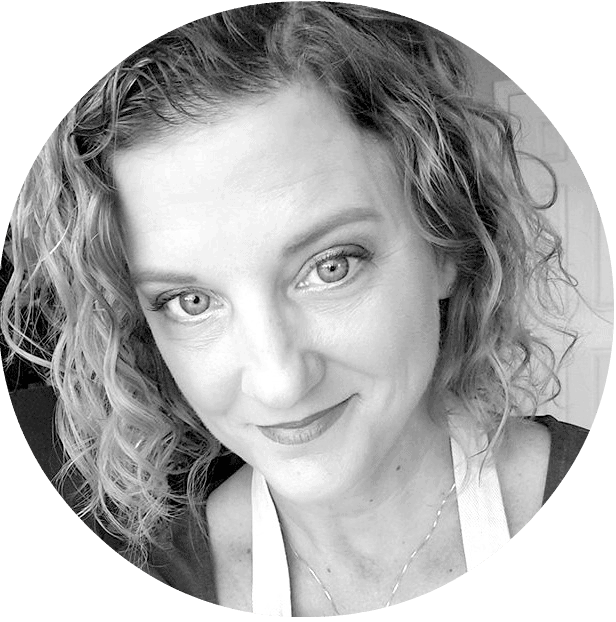 BUT, if you like crispy fried tenders, like those available in most grocery store deli sections anymore (and you want more happiness) ….then go for it. 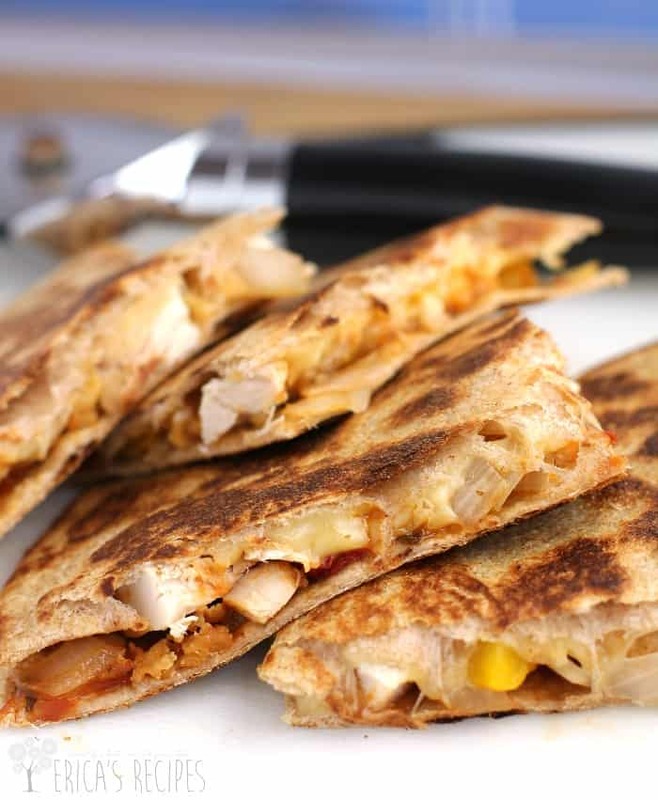 Because the crunchy chicken in a cheesy, crispy quesadilla, is just. so. friggin. tasty. And some sweet roasted bell pepper (which did not photograph well a-tall, so no pic). …and the chutney! This simple, sweet chutney is so damn tasty. Only three little ingredients, it comes together in a sec. And whatever you don’t use for the quesadillas, use for what-ev-ah you can think of …chicken, salmon, steak, baked potatoes, sub sammies, whatever. Seriously good eats. So here is it kids! A yummy, random lunch. That’s how I had it anyway. But I would (will) totally do this for dinner too. Amazing flavor combination and easy to make. Different, not totally unhealthy. And yummy yummy good. Put on the oven broiler. Roast the bell peppers, turning a quarter turn every 5 minutes, directly under the broiler. 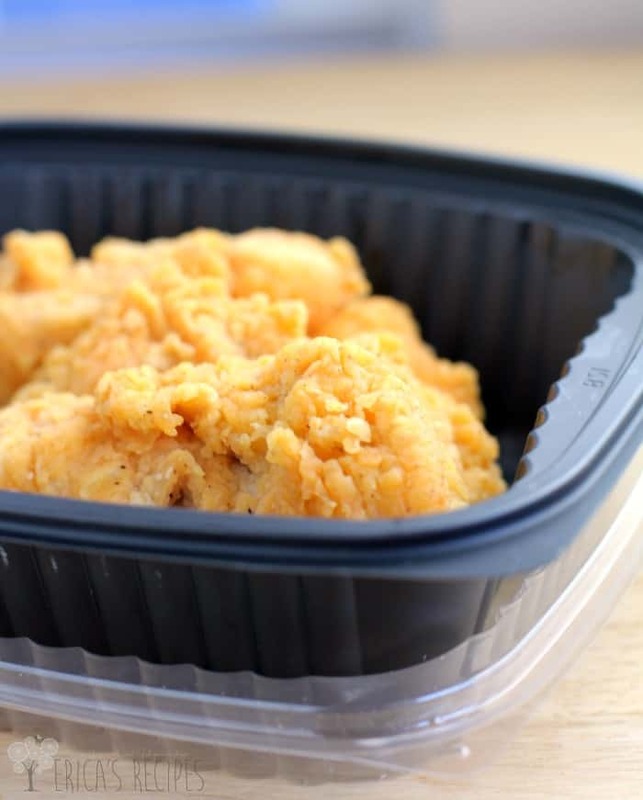 Transfer to a ziploc bag to steam 5 minutes. While the peppers are cooking, cook the onions. 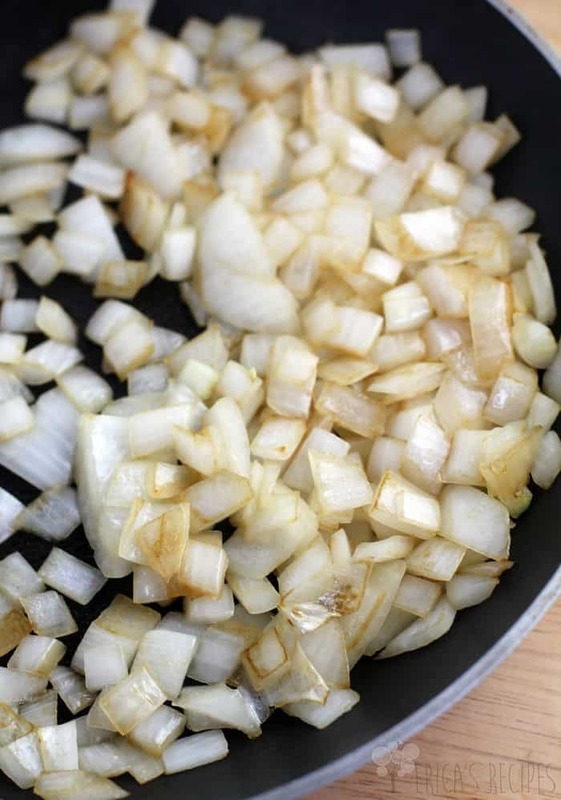 In a nonstick pan, saute the onions in the olive oil over high heat until lightly browned. Add a pinch of salt and set aside. Remove the peppers from the ziploc bag. Discard the blistered skins and seeds, and chop the peppers. Set aside. 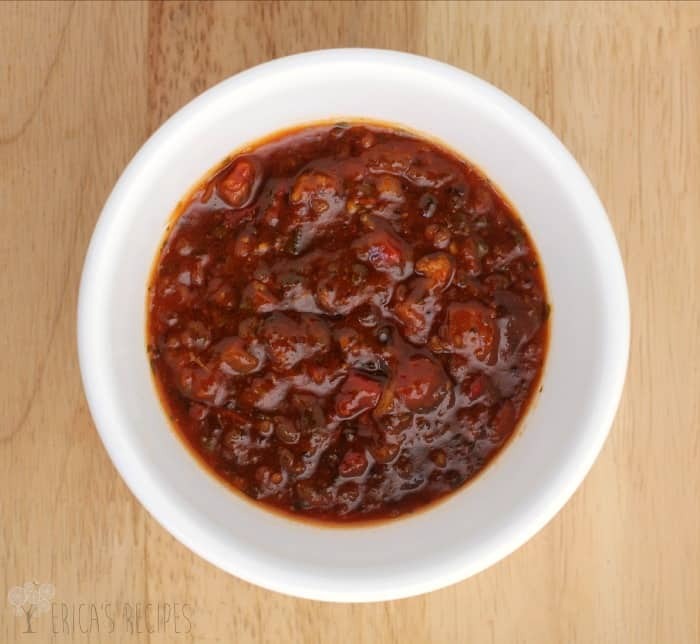 To make the Sun-Dried Tomato Chutney, simply combine the sun-dried tomato pesto, apricot preserves, and balsamic vinegar in a small bowl. To assemble a quesadilla: lay a tortilla on a board or dish. Spread a couple tablespoons of the sun-dried tomato chutney. Layer 1/4 of the onions, roast yellow bell pepper, chicken, and cheese. Top with a second tortilla. Heat a large nonstick skillet over medium-high heat. Spray with cooking spray. Carefully slide an assembled quesadilla into the pan. Spray the top tortilla with cooking spray. Cook until bottom quesadilla is toasted. Put a heat-resistant bake sheet or dish on the pan and quickly flip to transfer the quesadilla out of the pan. Then carefully slide the tortilla back into the pan to toast the other side. Once done, slide to a board or dish to cut and serve. Yields 4 servings. If this recipe looks good to you, check out my Spinach, Mushroom, and Thyme Quesadillas with Smoked Gouda. 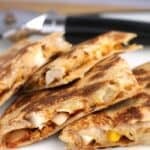 The sun-dried tomato chutney sounds so good, I have to give it a try and of course who doesn’t love a quesadilla? Great recipe. I love the sound of the tomato chutney. What a great way to add flavor to an easy weeknight meal. No food snobbery here; I am all about convenience. I sometimes buy those already made chicken to create other recipes. Who the heck has the time to do it all from scratch EVERYDAY? Not I! Anyhoo the chutney sounds awesome and hello, who doesn’t love a quesadilla! Erica…it’s only 9:30 am here and I am craving your quesadillas right now! So fun and flavorful! WHAT? This is happening soon! 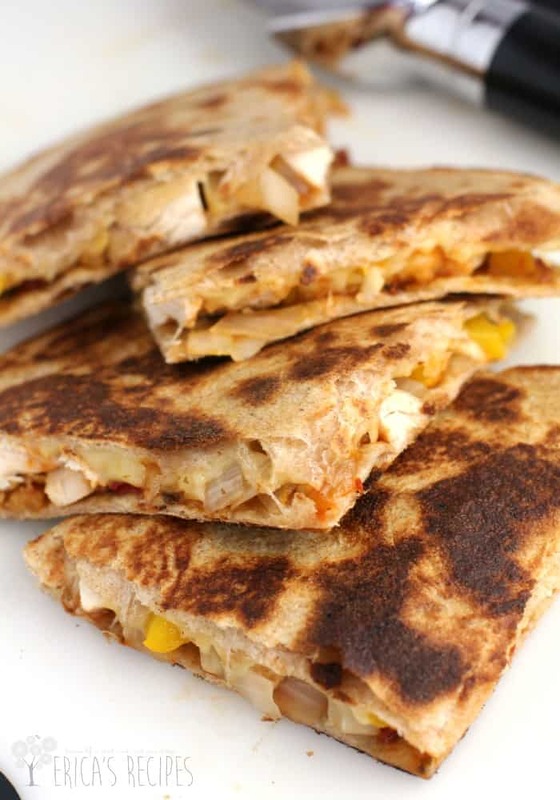 The fam loves those Publix Chicken Tender subs, so I know in a quesadilla this will be ah-mazing! That chutney sounds out of this world! I love making quesadillas with all kinds of different fillings. And, I adore your Sun-Dried Tomato Chutney; it looks fabulous! I love it when an idea turns out fabulous like this! Love the combination of your quesadilla Erica! YUM! Pinned and shared!